Tilly is one little character! She is full of energy and has the spunkiest personality! She loves zooming around the shelter, chasing balls and climbing high up on cat trees. When she gets in her playful mood, she’s like a wild child! But once she settles down, she’ll rub against you, asking for some loving. We rescued Tilly from an over-crowded animal control. When we noticed how sickly she was, we knew we had to help her. Once we brought her back to the shelter, we found out she was pregnant with one kitten. Sadly, her baby did not make it. Tilly was just too sick to be able to have a healthy baby. After a lot of TLC, she got better and is now ready for her forever home. She has never had a family of her own and she is super excited to start her new life! Tilly has an adorable head tilt, which adds to her silly and charming personality. She has seen a vet and it’s likely due to a previous ear injury. She does not need medication and the vet is not concerned. 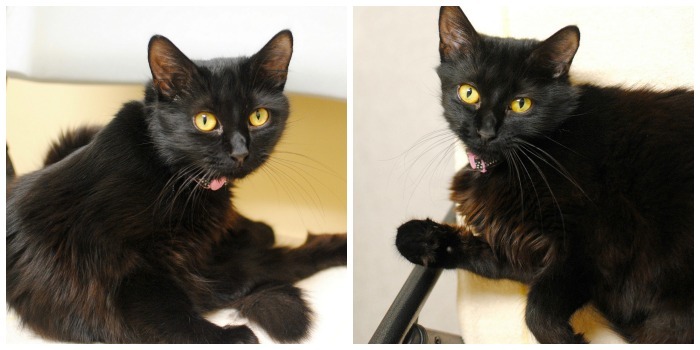 If you’re looking for a friendly, outgoing cat to join your family, come by and meet Tilly!